Helquist, Brett. Very Good. Bud Barkin, Private Eye (Tales from the House of Bunnicula (Unnumbered Paperback)) by Howe, James. Trade paperback (US). Glued binding. 88 p. Contains: Illustrations. Tales from the House of Bunnicula (Unnumbered Paperback). Intended for a juvenile audience. Helquist, Brett. Good. 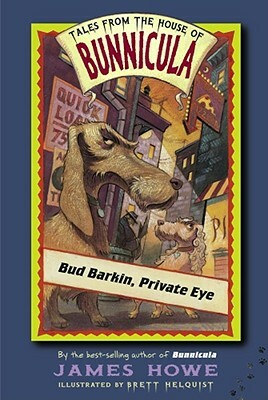 Bud Barkin, Private Eye (Tales from the House of Bunnicula (Unnumbered Paperback)) by Howe, James, 2004-05-01. Trade paperback (US). Glued binding. 88 p. Contains: Illustrations. Tales from the House of Bunnicula (Unnumbered Paperback). Intended for a juvenile audience. Very Good. 0689869894 Ships from Tennessee, usually the same or next day. Helquist, Brett. Good. No dust jacket. Ex-library. Signed by previous owner. Bud Barkin, Private Eye by JAMES HOWE ILLUSTRATED BY BRETT HELQUIST Hardcover CONDITION GOOD EX-LIBRARY BOOK-COPYRIGHT 2003 Grade 3-5-Howie, the irrepressible dachshund, tries his hand-er, paw... Sewn binding. Paper over boards. Contains: Illustrations. Tales from the House of Bunnicula (Unnumbered Hardcover). Audience: Children/juvenile. Bud Barkin, Private Eye by JAMES HOWE ILLUSTRATED BY BRETT HELQUIST Hardcover CONDITION GOOD EX-LIBRARY BOOK-COPYRIGHT 2003 Grade 3-5-Howie, the irrepressible dachshund, tries his hand-er, paw-at writing detective fiction. He imagines himself as Barkin, a hardboiled shamus with a nose for crime and an eye for the dames. The detective is working late when a beautiful blonde tumbles through the door of his office-"trouble with a capital T." Delilah claims she's being followed, and Barkin suspects Crusty Carmady, an old enemy who's just been sprung from Sing Sing. But, is Delilah on the run from Carmady-or in cahoots with him? The whodunit action alternates with selections from Howie's writing journal in which he ponders the craft of writing and the editorial suggestions of Uncle Harold (the sheepdog "author" of the "Bunnicula" stories). The narration is an affectionate parody of the gumshoe genre, filled with the kind of mock tough-guy similes that would make Mickey Spillane proud. ("She looked me over like I was a used car she was thinking of buying if the price was right.") Howie's journal observations provide an amusing demonstration of the creative process and the challenges of authorship. The last chapter is a bit frantic as Howie attempts to tie up all the plot threads at once-explaining any remaining inconsistencies as "red herrings." While this title has little relationship to the original "Bunnicula" stories, it should appeal to mystery fans who like their crime spiced with chuckles.